Archive of 1999 PNC Info. 12/27/99 - The Self-Adhesive Bicycle (Scott #3228) with plate #888 has been confirmed in rolls of 10,000 by Donna Rajotte, the philatelic clerk at Providence, RI. She reports that she has plate #888 with Top and Bottom back numbers - 420 needed for a # on # hit. 12/04/99 - Plate #9999 on the PSA 100 33c City Flag has turned up in Florida. It should be widely available soon. 11/18/99 - Ms. Renate Fearonce, the philatelic clerk at Tucson, AZ received the following items: 3k S/A Wetlands, (Scott #3207A) #2222 with blue bottom back numbers; 10k S/A Diner, (Scott #3208A) #22211 with blue bottom back numbers; 20c Cog Railway, #s 1 & 2; 23c Lunchwagon, #3. 11/14/99 - Donna Rajotte, the philatelic clerk at Providence, RI has the (10c) S/A Eagle and Shield Presorted STD (Scott #3271) coil with plate #22222, even, with Bottom back numbers - 420 needed for a # on # hit. 11/10/99 - The Self-Adhesive Bicycle (Scott #3228) with plate #s 444 and 555 has been confirmed in rolls of 10,000. Donna Rajotte, the philatelic clerk at Providence, RI reports that she has plate #777 with Top back numbers - 420 needed for a # on # hit. 11/02/99 - The missing links - Self-Adhesive 10c Bicycle (Scott #3228) with #666 and #777 have turned up. Donna Rajotte, the philatelic clerk at Providence, RI reports that she has plate #2222 on the SA 20c Pheasant (Scott #3055) coil of 100. Just in case I missed this, there are two new numbers on the 25c SA Diner (Scott #3208A): S22211 and S22222. 10/30/99 - Several new plate number combinations to look for since the last update: Self-Adhesive Wetlands (Scott #3207A) with #3333; Self-Adhesive Bicycle with #888 and #999. The 999 has shown up in Providence, RI. 10/19/99 - Several new plate number combinations have turned up since the last update: Self-Adhesive Wetlands with #2222; Self-Adhesive Diner with #22222; Self-Adhesive Bicycle with #444 and #555. 10/11/99 - Lots of exciting things happening on the PNC scene. Three major varieties of the 1c Kestrel have appeared. The major difference is the order of the colors in the plate number. All are #1111, but the color combinations are different on each. The 10c Eagle and Shield Self-Adhesive has been found with very pronounced tagging. The Lick n Stick 5c Wetlands and the 5c Circus Wagon (#S2) have been found with both large and small perf holes. The 5c Circus Wagon also exists with tagged red ink. 10/08/99 - The US Postal Service today issued a water-activated version of the 22c Uncle Sam stamp (Item 7724) in coils of 3000. The lone plate number reported is 1111 (yellow, red, blue, black). The plate number interval is 24 stamps and the blue/green backs numbers, both top and bottom, are every twenty stamps. 10/04/99 - A philatelic clerk reported today that he has a 10k PSA roll of the 10c Bicycle with plate #555. No back number info available. 10/02/99 - Plate #8888 on the PSA 100 City Flag has turned up in Hudson, NH 03051. 8/29/99 - I've added two new links in the "Useful Sources of Information" Box below. One is the Bureau Issues Association by John Larson of plate numbers, positions and USPS order numbers on 1999 US issues. The second is a detailed listing of all 1999 US issues, including earliest known uses, and lots of pictures compiled by Jay Bigalke. 8/27/99 - Robert Starkey, the Philatelic Clerk in Providence, RI has a new number on the City Flag SA coil of 100, that being 8888. 8/22/99 - Robert Starkey, the Philatelic Clerk in Providence, RI has announced that effective August 30, he will relinquish his position for health reasons. Bob will be replaced by Donna Rajotte. We all wish Bob well in his new position and welcome Donna. 8/17/99 - City Flag S/A coils of 100 have turned up with plate combinations 6666 and 7777. Coils of Fruit Berries have surfaced with plate numbers 1112 and 2211. 7/9/99 - City Flag Plate #s 3433 and 4444 have been found in the same bubble flat of 50 coils at the Perryville, MO post office. 5/14/99 - Scott Publishing has assigned the following numbers to the Fruit Berries S/A coil of 100. Scott will list this issue as a plate number coil strip of five consisting of two Scott #3302 and one each of #3303-3305. The general consensus among collectors is to collect these in strips of nine. 5/12/99 - A new plate number combination, B2221, has been reported on the Fruit Berries S/A coil of 100. 5/02/99 - Three new plate number combination have been reported on the 33c City Flag S/A coil of 100. The new numbers are 4443, 4444 and 5555. 4/22/99 - The USPS announced today in Postal Bulletin 21996 the withdrawal of the following coils from sale at Stamp Fulfillment Service (SFS) and authorized philatelic windows effective June 30, 1999. ** Item 7703 - $500.00 Seaplane $1.00 coil (reprinted 1998). ** Item 7930 - $20.00 Blue Jay coil (Issued 8/2/96). ** Item 7934 - $500.00 Butte Nonprofit coil (Issued 1995 & Reprinted 1996). ** Item 7938 - $125.00 Jukebox First-Class Presorted coil (Issued 1995). ** Item 7939 - $750.00 Jukebox First-Class Presorted coil (Issued 1995). ** Item 7940 - $2,500.00 Jukebox First-Class Presorted coil (Issued 1995). ** Item 7946 - $2,500.00 Jukebox First-Class Presorted coil (Issued 6/15/96 & Reprinted 5/98). ** Item 7948 - $1,000 Eagle & Shield Bulk Rate coil (Issued 5/21/98). ** Item 7949 - $25.00 Mountain Nonprofit coil (Issued 3/16/96). ** Item 7950 - $150.00 Mountain Nonprofit coil (Issued 3/16/96). ** Item 7951 - $500.00 Mountain Nonprofit coil (Issued 3/16/96). ** Item 7956 - $500.00 Mountain Nonprofit PSA coil (Issued 3/16/96). ** Item 7975 - $750.00 Jukebox First-Class Presorted PSA coil (Issued 1/24/97). 4/03/99 - Scott Publishing announced catalog numbers for the City Flag coil stamps. ** 3280 - Water Activated in rolls of 100, 3000 and 10,000. ** 3281 - Self Adhesive in rolls of 100. Stamps have square corner tips. ** 3282 - Self Adhesive in rolls of 3000 and 10,000. Stamps have rounded corner tips. 4/04/99 - Plates B1111 and B2222 reported to exist on the new Fruit Berries coils to be issued April 10. Coils of B1111 were purchased and postmarked 4/3/99. 3/28/99 - Added known plate numbers to City Flag listing. Click on links below. Reports from several people that plates B1111 and B2222 exist on the new Berries coils to be issued next month. Busy this past weekend eliminating the pop-up ads from 'many' pages. 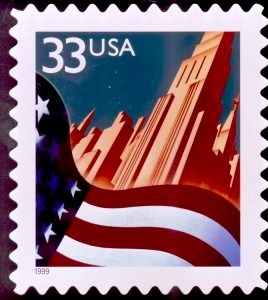 2/11/99 - The USPS announced today in Postal Bulletin 21991 the formats of the 33c City Flag coil stamps that will be issued February 25th. The formats will include a Self-Adhesive coil of 100, 3000 and 10,000. Water-Activated coils will also be available in coils of 100, 3000 and 10,000. 2/06/99 - Scott Publishing has announced the following assignments of catalog numbers for coil stamps. 1/14/99 - The USA Philatelic Catalog, Spring 1999 edition, arrived today. Quite a few coils are listed as going off sale effective 3/31/99. ** Three versions of the 32c Flag Over Porch, Item #7901, #7902 and #7904. ** Two versions of the 1c Omnibus, Item #7051 and #7904. ** Three versions of the 3c Conestoga Wagon, Item #7762, #7763 and #7764. ** $1 Seaplane, Item #7703. ** Two versions of the 5c Circus Wagon, Item #7754 and #7755. ** Four versions of the 10c Bulk Rate Auto, Item #5790, #7935, #7936 and #7937.